Does anyone know where I can get Child Design Crib Parts? 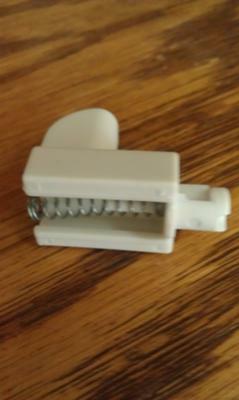 I'm looking for a replacement for the plastic piece with the spring for an old Child Design baby crib. If you have one of the plastic pieces that I need to put the bed together (see the attached picture) or anyone has any suggestions for a resource that carries Child Design Crib Parts can you please contact me using the space below (and PLEASE include your contact information in case I need to get in touch with you!). Unique Baby Gear Ideas encourages our visitors to share their resources for Child Design crib replacement parts, alert us to crib recalls and to consider writing reviews of their cribs to make our little community of expectant parents aware of any problems that are associated with different models and brands. I believe that I read somewhere that Kolcraft may is associated with the manufacture of Child Design cribs and that you can order replacement parts from them. 8 am-3:30 pm Friday) or by visiting the Kolcraft website.